Sicily 2009 – The Plan! As with our previous adventures in Sicily, the plan for this trip begins with the inevitable cheap flights to Palermo with Ryanair, booking a hire car and an overnight hotel and airport parking package from Parking4Less. We just have to visit Mount Etna whilst we're in Sicily, so we've arranged a few days' stay at Hotel Corsaro, but significantly we want to spend some more time in the limestone areas of Sicily – particularly the Nebrodi and Madonie mountains. With this in mind, we've booked our first couple of nights at the Agriturismo Il Noceto, north of Randazzo on the edge of the Nebrodi, and will be exploring some of the walking trails here. Add to the general plan a desire to explore some of the lava caves on Etna herself, and a strong urge to re-visit the continuously-active craters of Stromboli, and who knows where we will head to from the snowy slopes of Mount Etna! The usual blast down the M1, and we were soon to find ourselves nearing Stansted Airport once more. We stopped off at Ugley for some pub-grub, before making our way to the Radisson on-airport hotel for our overnight and parking deal. The shock of paying £3.90 for a pint of Guinness was softend slightly by a curious display of what appeared to be some of the most unusual SRT techniques we've ever seen! An absolute cavers delight - although arguably a display that entertained the male residents rather more than the ladies. Having waited for a large crowd of errant Sicilian schoolgirls to board the plane, we finally took off, landing in Palermo only a few minutes late. Time was lost again, however, in Palermo itself, which took an hour to get through!! Deciding against a lunch stop in Cefalu as everyone else appeared to have the same idea, we drove instead up to Santa Agata and thence on to Cesaro and Randazzo. Our first views of the Nebrodi were somewhat marred by low cloud and rain, but we did encounter three Nebrodi black pigs and a couple of the beautiful San Fratello red-coated horses en-route! Then set out on a walk along the route of the infant Alcantara river starting from Randazzo. A wonderful route where we navigated a loop to avoid returning along too much of the same track. The wild flowers were stunning, particularly the umpteen varieties of orchids and the monstrous umbels of giant fennel in full bloom. After a mere 19km walk, with ~500m of ascent, we returned to our most splendid Agriturismo for far too much food, wine, and bed. So much for an easy first day out! Tomorrow we move to Hotel Corsaro on Mount Etna. Having checked out from Agriturismo Il Noceto (recommended - they were more than happy to cater for a couple of veggies) we took the road towards Floresta, soon turning off to traverse alpine style meadows and a spectacular limestone valley/gorge heading down towards Roccella Valdemone – a typical Sicilian town perched high up between two impressive rock buttresses. Just beyond Roccella Valdemone lies the Parco Za Draga – a nature park within which are some fine, and not too arduous hiking trails. After a little "off-piste" hiking with superb views over Roccella, and towards a cloud-enshrined Etna, we returned to the car, narrowly avoiding a mighty thunderstorm that had been threatening to drench us for the past hour or so. After a drive through torrential rain, we arrived at the familiar Hotel Corsaro, with a snow covered Mount Etna as a backdrop. Over breakfast, we discussed tactics for the day as the snow started to fall. Sensibly, we waited for the snow plough to clear the road before we took the none-too-sure-footed Fiat Panda down to Nicolosi where we again tried in vain to locate maps – though we did find a new climbing & skiing equipment shop, and our later start meant we had the opportunity to catch up with our friend Davide Corsaro as he arrived at the hotel for the day. Back at Sapienza, the mountain weather had set in and visibility was down to near-zero, although it was clearly warming up and the snow starting to thaw. Despite a certain individual’s optimism that the clouds were going to clear, it was decided that the only pleasant option was to drive down the volcano until we hit better weather – so we chose to try a new route (for us, that is) into the Valle del Bove from Zafferana Etnea. This proved to be a good move, (once we had escaped from a VERY talkative Sicilian goatherd!) taking us through delightful forest and across lava flows to eventually give fantastic views of the volcano as the weather cleared, including the glowing lava flows of the ongoing eruption that started in May 2008. Tuesday May 5th 2009 - A regular Tuesday caving trip? What with it being a Tuesday and all that, then it seemed only good and proper that we should go caving. 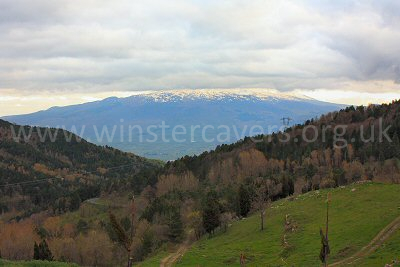 The Winster Cavers (nearly) always go caving on Tuesday, so today should be no exception, and being 2000m up a volcano would be a poor excuse for not caving. Helmets, lights, walking boots, waterproofs, camera, GPS, etc, etc, packed, we drove over to Piano Provenzana, from which a trek around the Monte Nero crater was going to take us towards a series of lava tubes that have been on our list of caves to visit for some time - namely Grotta dei Lamponi, Grotta delle Femmine and Grotta delle Palombe. We navigated our way perfectly to the Rifugio Timparossa, stopped for a slurp of water, and watched as an impressive and violent electric storm came in! Three inches of snow and two hours later, we retreated for a snowy hike back, followed by coffee at the Bar Provenzana, and back to Hotel Corsaro. With a forecast of mostly fine weather, and just a chance of isolated storms in the afternoon, we decided today was our best chance of getting to the top craters of Mount Etna. So after a prompt breakfast we made for the Funivia dell’ Etna, and took a one-way journey up the cable car. Surrounded by snow, we hiked up the jeep track from Piccolo Rifugio to the Torre del Filosofo – through impressively deep channels made in the snow, and with the cloud sweeping in and out of our path. From the plateau at 2900m, the views of Etna’s snow-covered craters were a sight to behold. We struck across the snow fields up to the Bocca Nuova but the cloud, and the associated weather, started to close in quickly. At 3165m altitude, a storm was clearly brewing. The sky darkened, an occasional clap of thunder could be heard, and it was time to retreat, just 150m altitude from the Bocca Nuova crater rim. Lightning is probably the biggest danger on Etna, and visibility was diminishing fast. We descended swiftly through cloud, snow and rain, to arrive safely at Hotel Corsaro early evening. After breakfast and a chat with Mr. & Mrs. Krabusch (arguably the most informed visitors Mount Etna has) we set out for a “short” walk up the Schiena del’ Asino – a ridge and viewpoint over the Valle del Bove. As we climbed, the clouds came in once more, allowing us just an occasional glimpse of the impressive Valle. We cut across the lower flank of La Montagnola, somewhat off-piste, to intercept the more regular descent routes back down to Sapienza. 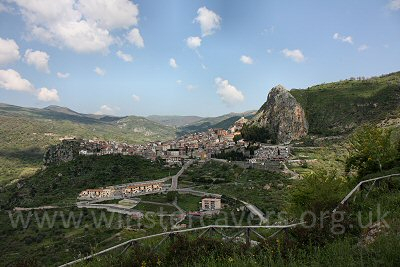 Having said our goodbyes to our friends at Hotel Corsaro, we drove over to the Madonie Mountains. To our surprise, many of the agriturismos were closed, and our original plans for accommodation went by the wayside. The relatively inexpensive Hotel Mariano, in Castellana Sicula was open though – and was to be our base for the remainder of our stay. 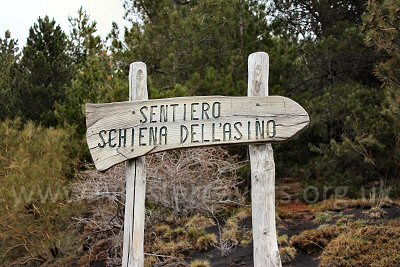 The start of the hiking trail up the Schiena del Asino ridge that leads to the top craters of Mount Etna. 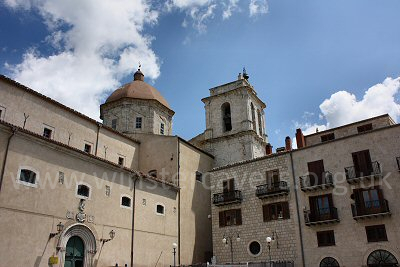 A visit to the tourist office in the beautiful town of Petralia Soprano, and we were the proud owners of a (free) 1:50,000 hiking map of the Madonie region. So armed with our map, and route description in the Rother walking guide, we drove out to the Valle del Canna to walk the gorge. The "well trodden path" described in the guide no longer exists, and a frustrating degree of bush-whacking was required to gain the river bed far below. Having decided that the several river crossings required were going to entail rather wet boots, we decided instead to climb up, and to top-out on Pizzo Canna – a fine and slightly exposed peak with excellent views across the Madonie mountains. The day ended most satisfactorily, with pizza, wine and, to our surprise, meeting up with a fellow traveller we’d encountered on Etna. Somewhat wary after yesterday’s adventure, today we picked a route that was not only clearly marked in both our guidebooks but on the 1:50,000 walking map of the Madonie as well. An amusing drive (due to broken roads falling off the hillside) through Polizzi Generosa took us to an impressive area of sheer limestone cliffs and buttresses, the start of our walk and the Valle Madonna degli Angeli (Valley of Madonna of the Angels). 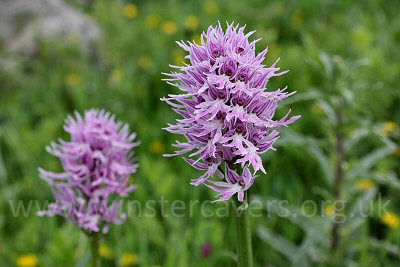 Walking up through pine woods carpeted with wild iris and orchids, we soon gained our first views of the spectacular Valle. A relentless climb took us past Nebrodi firs and other endemic plants to a col from where we steadily climbed up to the breathtaking viewpoint at the summit of Monte San Salvatore. From this lofty vantage point, we could see as far as Mount Etna and the Aeolian islands. An awkward pathless descent down Mt. San Salvatore and we were on the return route of our figure-8 loop. A long day’s walk, but truly scenic and worth every step! 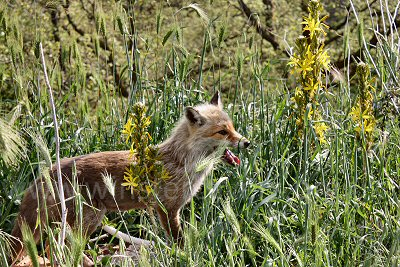 A chance encounter with a Sicilian Mountain Fox in the Madonie Mountains. Our last day in Sicily, so we’d promised ourselves we’d take it easy. But the lure of climbing the highest peak in the Madonie proved too much, and again we donned the walking boots and headed for the hills. The hike to the top of Pizzo Carbonara (1979m) was superb, with grand vistas across the island – from Palermo in the West, to the Aeolian Islands in the North and Mount Etna in the East. The walk complete, we drove over to Isnello to check out the location of Abisso del Vento. 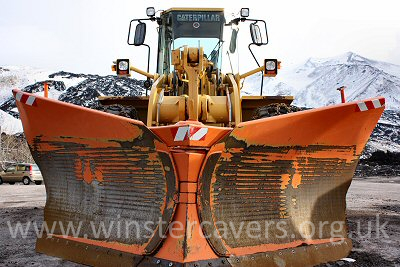 The cavers’ car park was duly located, complete with a suitable array of cavers’ cars, although the cave lies on private land so we stopped short of trekking to the entrance. One to earmark for our next visit to Sicily. Tomorrow we return home, fuelled with ideas for future adventures. 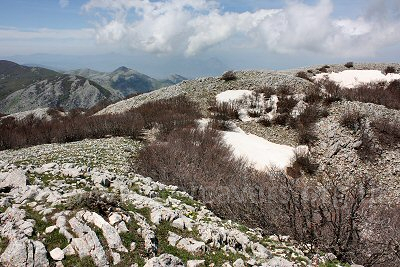 The last snow on the tops around Pizzo Carbonara, the highest peak in the Madonie Mountains, Sicily.